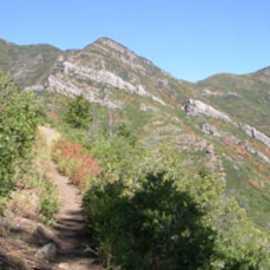 1.75 mi/2.8 km one-way — This trail in Millcreek Canyon climbs to an overview of the Salt Lake Valley and offers a spectacular sunset vista of the Great Salt Lake. Enter Millcreek Canyon from 3900 South. 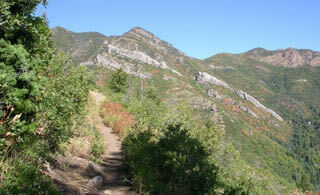 The trail begins just east of the Millcreek Inn Restaurant, .75 miles from the bottom of the canyon. A sign indicating the trailhead is just a few yards south of a clearly visible restroom.This trail climbs 1,250 feet on long gradual switchbacks. Take your time and enjoy the scenery along the way.